Are you bored of usual looking simple screenshot of websites and application software? Add some jazz and style to screenshot images by rendering fancy effects using portable tool “Screenie”. Using this tool, you can place multiple screenshot images in stylish manner at different angles with cool reflection effect. Best part, it is very easy to use tool. 3. Drag drop screenshots to question marks (?) on the application window. 4. 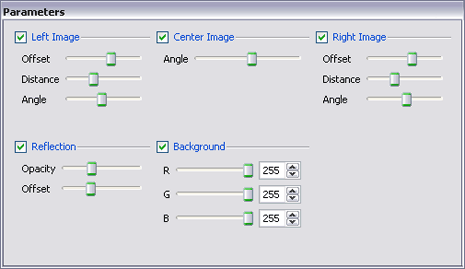 Using Parameters window adjust opacity, offset, distance, angle and more. 5. Right click on application window to save stylish screenshot as PNG image. You can take screenshot with any method starting from using Print Scrn key on the keyword to numerous free tools. Screenshots in Firefox, tools for screenshot on Mac OSX, free tool for screenshots. Once you take the screenshot, add them to Screenie progam for extra style and jazz, what say? Use Bender Converter – benderconverter.com – to make screen shots from YouTube Videos. It very nice service!